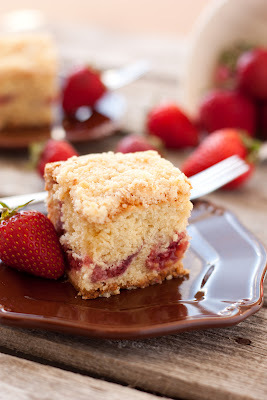 I tell you no lie when I say this Strawberry Coffee Cake is the best coffee cake I’ve ever eaten! I love it! It makes sense that I like it so much because I adapted the recipe slightly from my favorite ever blueberry muffins recipe. I had some fresh strawberries in the fridge I needed to use up and I’ve been wanting to make a coffee cake recipe for some time so I decided why not strawberry? 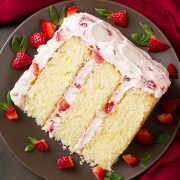 The combination of flavors in this cake is irresistible! You get a melt in your mouth, deliciously flavorful, buttery cake that sandwiches a layer of fresh, sweetened, juicy strawberries then to finish it off it’s crowned with a generous amount of an incredible crumb topping (I’ve said it before, please don’t substitute the Turbinado sugar, I think it’s a must). Everyone was coming back for more of this heavenly cake. 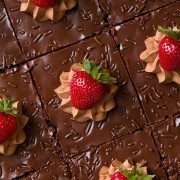 Make it for dessert or a breakfast treat (I mean really what better way to start the day =), either way I have the feeling you’re going to love this recipe. Enjoy and share! 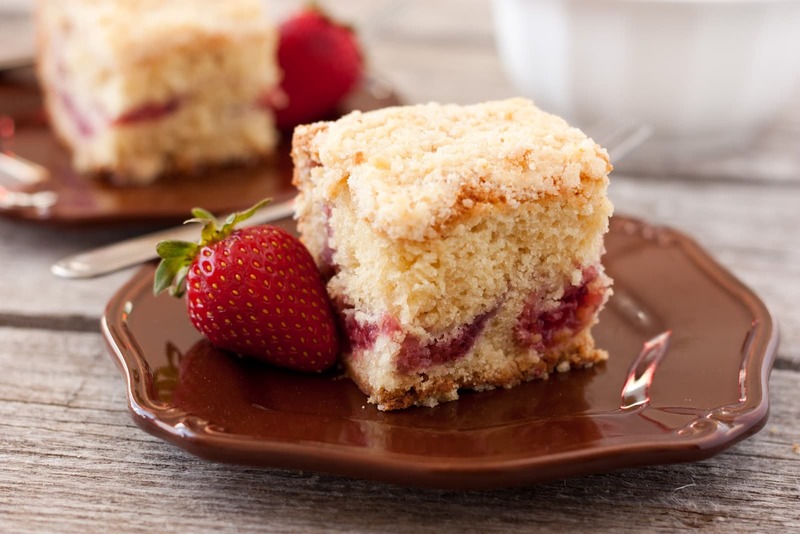 Deliciously soft and buttery cake swirled with a layer of vibrant fresh strawberry filling and finished with a crisp crumb topping. In a medium saucepan whisk together 1/4 cup granulated sugar and cornstarch. Stir in cold water and lemon juice. Add in strawberries. Bring mixture just to a boil over medium heat, stirring constantly. Once mixture reaches a boil, reduce heat to low and simmer about 1 minute, stirring constantly, until thickened. Remove from heat and set aside to cool. Add 1/3 cup all-purpose flour, 1 1/2 Tbsp granulated sugar and 2 1/2 Tbsp butter to a small food processor. Pulse mixture just a few seconds until combine (it should still be fluffy, if you pulse to long it will become too dense). Pour crumb mixture into a small bowl and whisk in Turbinado Sugar, set aside. In a mixing bowl: whisk together 1 3/4 cup flour, baking powder, baking soda and salt, set aside. In the bowl of an electric mixer, whip together 7 Tbsp softened butter and 1 cup granulated sugar until pale and fluffy, about 4 minutes. Stir in egg and vanilla. Mix in sour cream. Add dry ingredients alternating with buttermilk in two separate batches and mix just until combine. Pour and evenly spread 1/2 of the cake batter into a greased 8x8 baking dish. 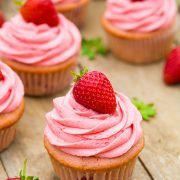 Spread strawberry mixture evenly over batter layer. Dollop remaining batter by the spoonfuls over strawberry mixture and gently spread batter into an even layer. Sprinkle top evenly with crumb topping. Bake in preheated oven 50-55 minutes until golden and toothpick inserted into center comes out clean. Allow to cool slightly before cutting (if you can =). Cookie: I used your recipe with some changes and made this awesome coffee cake! Thanks for sharing. Loved it and so did my coworkers!